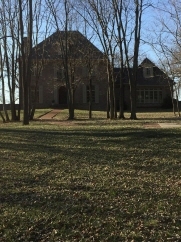 Description: Beautiful 3 story brick home located on 1.83 acres in beautiful farm area. 3 bedrooms, 3 full baths and 3 half baths. Lovely courtyard. Ceiling fans (2) on porch. Gas starter on kitchen porch. Propane gas cooktop and fire starters. Basement has roughed-in bathroom engineered to convert to walk-out to the beautiful courtyard. Attached garage, covered patio, wood fence, landscaped yard, paved drive and workshop. Must see. Data believed correct but not guaranteed. Buyer to verify data prior to offer. Agents read agent remarks.